The year is 2161, and the earth has been altered by ecological and seismological disasters. In Fracture, players are able to reshape the battlefield with futuristic weaponry in what could be called the next-generation of gameplay — “Terrain Deformation”. Stem cell research is also out of control, as an epic battle between genetics and cybernetics ensues. 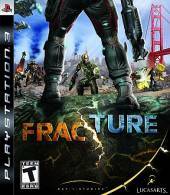 The new LucasArts game release, Fracture 3, is now available to demo on PS3 and Xbox 360. You can download the demo on both the Playstation Network and Xbox Live Marketplace. The demo is for single players, however the full release will allow multi-player modes for up to 12 players. Fracture is scheduled for release on October 7 in the United States, and October 10 in Europe. LucasArts has received rave reviews on its recent release of Star Wars: The Force Unleashed. From what we can see so far, Fracture is looking to be another huge success.